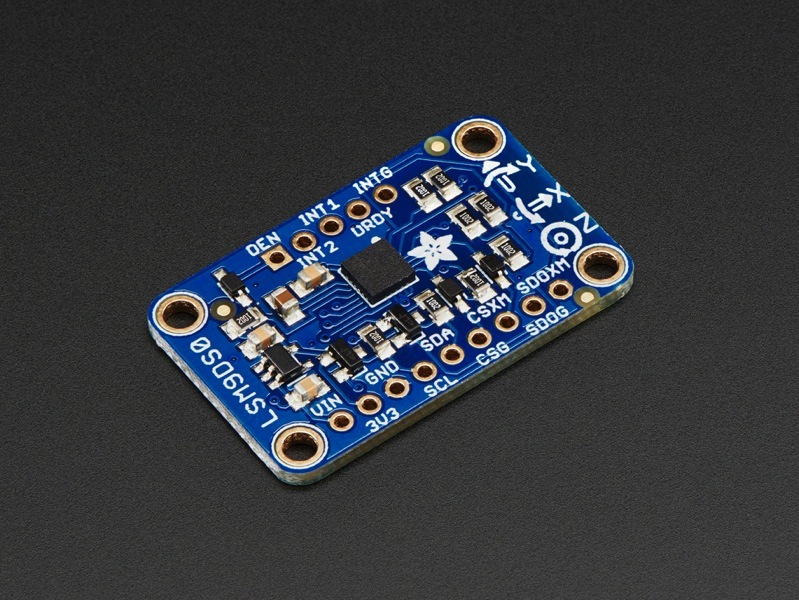 NEW PRODUCTS – Adafruit 9-DOF Accel/Mag/Gyro+Temp Breakout Board – LSM9DS0 // FLORA 9-DOF ACCELEROMETER/GYROSCOPE/MAGNETOMETER – LSM9DS0 « Adafruit Industries – Makers, hackers, artists, designers and engineers! 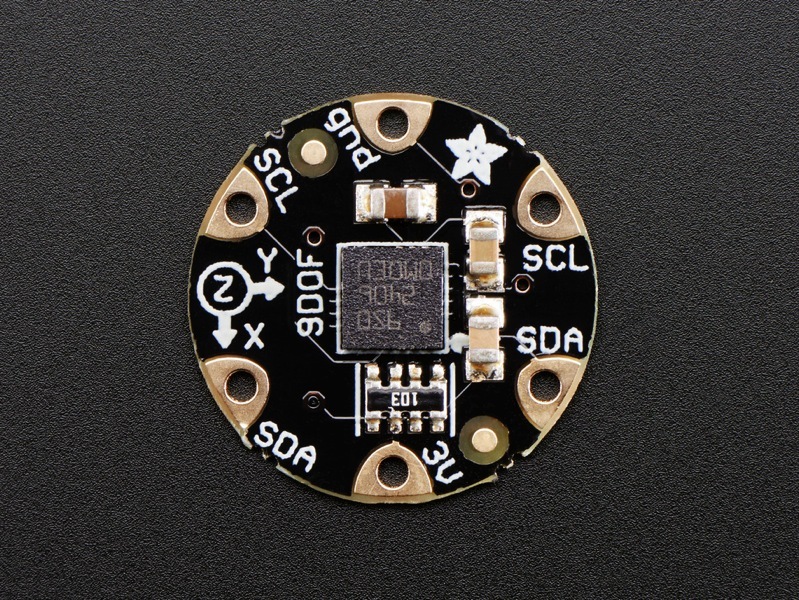 NEW PRODUCT – Adafruit 9-DOF Accel/Mag/Gyro+Temp Breakout Board – LSM9DS0: Add motion, direction and orientation sensing to your Arduino project with this all-in-one 9-DOF sensor. Inside the chip are three sensors, one is a classic 3-axis accelerometer, which can tell you which direction is down towards the Earth (by measuring gravity) or how fast the board is accelerating in 3D space. The other is a 3-axis magnetometer that can sense where the strongest magnetic force is coming from, generally used to detect magnetic north. The third is a 3-axis gyroscope that can measure spin and twist. By combining this data you can REALLY orient yourself. When we saw the new LSM9DS0 from ST micro we thought – wow this could really make for a great breakout, at a very nice price! Design your own activity or motion tracker with all the data… We spun up a breakout board that has all the extra circuitry you’ll want, like a 3V regulator and level shifting circuitry so it can be used by 3V or 5V power/logic microcontrollers like the Arduino. The sensor has both I2C and SPI interfaces. Attaching it to the Arduino is simple, power Vin and GND with 3-5VDC, and wire up I2C data on SCL and SDA, and you’re ready to go! More advanced users can use SPI, our library has support for both. The breakout comes fully assembled and tested, with some extra header so you can use it on a breadboard. Four mounting holes make for a secure connection, and we put the popular power+data pins on one side, and the interrupt pins on the other side for a nice & compact breakout. Check out our Arduino library while we finish up the tutorial. The example and library code will work ‘out of the box’ with Arduino. Simply download our library and connect the Vin+GND and SCL/SDA pins, install the library properly and upload our test program to read out 9 degrees of motion. NEW PRODUCT – FLORA 9-DOF ACCELEROMETER/GYROSCOPE/MAGNETOMETER – LSM9DS0: Add motion, direction and orientation sensing to your wearable FLORA project with this high precision 9-DOF sensors. Inside are three sensors, one is a classic 3-axis accelerometer, which can tell you which direction is down towards the Earth (by measuring gravity) or how fast the board is accelerating in 3D space. The other is a 3-axis magnetometer that can sense where the strongest magnetic force is coming from, generally used to detect magnetic north. The third is a 3-axis gyroscope that can measure spin and twist. By combining this data you can REALLY orient yourself. When we saw the new LSM9DS0 from ST micro we thought – wow this could really make some wearables super smart. Design your own activity or motion tracker with all the data! The sensor has a digital (I2C) interface. Attaching it to the FLORA is simple: line up the sensor so its adjacent to the SDA/SCL pins and sew conductive thread from the 3V, SDA, SCL and GND pins. They line up perfectly so you will not have any crossed lines. You can only connect one of these sensors to your FLORA, but you can connect other I2C sensors/outputs by using the set of SCL/SDA pins on the opposite side. Oh well, technology just becomes better and cheaper all the time!